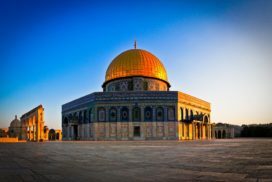 Jerusalem, known as Al Quds (Al-Kuuts) in Arabic, has been known for centuries as a center for three major religions: Judaism, Christianity and Islam. It is a city with amazingly broad human diversity, representing different races, religions and ethnic backgrounds. Jerusalem towers over all other cities by being a spiritual city. For the faithful, a visit to Jerusalem is a powerful affirmation of faith. Jerusalem is centered in the famous walled Old City, surrounded by high fortified walls, and to its side lays the Mount of Olives. A walking tour is the most popular way to visit the Old City of Jerusalem. Start at Damascus Gate, one of the city’s famous eight gates, and walk through the city’s labyrinth of crooked streets and alleys. In the Muslim Quarter of the Old City is the Dome of the Rock (Qubbat Al Sakhra), one of the oldest surviving examples of Arabic architecture. The massive Dome houses the ancient rock on which Noah’s Arc rested after the flood and where Abraham nearly sacrificed his son. Built on the site where Prophet Mohammed ascended into heaven on his famous night journey, this sacred site for Muslims around the world is visually spectacular, with dazzling blue tile mosaics, a golden Dome, and exquisite, mathematically accurate proportions. 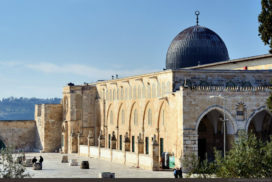 Nearby are the famous Al Aqsa Mosque and the Islamic museum, which was established in 1927 and houses beautiful stained-glass windows and a collection of old copies of the Holy Koran. Another path in the Old City is the Via Dolorosa, which traces Christ’s path to his Crucifixion. 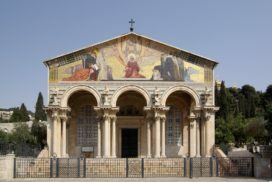 Start near Lions Gate and finish at the Church of Holy Sepulcher in the Christian Quarter. 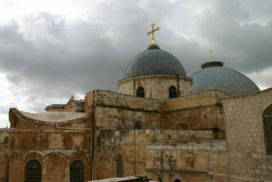 The Church of the Holy Sepulcher is reserved as the site of Jesus Christ’s crucifixion, burial and resurrection. 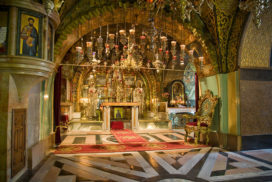 Over the course of many centuries, Christian pilgrims have journeyed to this holy shrine to see the golden socket that held Christ’s Cross, the crypt where he was laid, the stone where his body was anointed, and the tomb where he was buried. From the Dung Gate entrance of the Old City, you can walk to the Western Wall, also known as the Wailing Wall (AlBuraq) in Arabic. This wall is one of the most sacred Jewish sites. East of the Old City is the Mount of Olives, which offers a magnificent panoramic view of the entire city of Jerusalem. 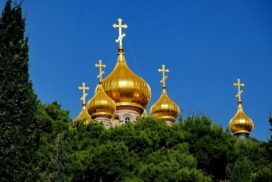 The Garden of Gethsemane, the Church of all Nations, and the Tomb of the Virgin Mary are located at the foot of the Mount. Midway up the hill are two famous churches: the Church of St. Mary Magdalene, a beautiful display of old Russian-style cupolas and domes which was erected in 1885 by Tsar Alexander III; and the Franciscan Church of Dominus Flevit, a simple structure built over the remains of a fifth century monastic chapel. The interior window above its alter has a breathtaking view of the city, including the Dome of the Rock in the distance. Perhaps it is the view that best captures the splendor and diversity of the Holy City of Jerusalem. The sources of Jewish, Christian and Muslim attachment to Jerusalem are deep and complex. The Jews consider the city “Uniquely Holy”, with Jerusalem being mentioned in different religious texts and holding a special place in Judaic tradition. The crucifixion of Jesus of Nazareth and his burial in Jerusalem make the city most sacred to Christians. Christian attachment to Jerusalem is reflected in the various names for the city contained in the Bible, such as City of Righteousness, Faithful City, City of God, Holy City and City of Truth. To Muslims, Jerusalem is second only to Mecca and Madina as a sacred shrine. Through the ages the Dome of the Rock, which looms above Jerusalem, has been revered and cared for by all Muslims. A woman said to the Prophet Mohammed, “Oh apostle of God! Give us rule as to Jerusalem”. And he said “It is the land of the resurrection and the judgment assembly; go there and pray. For indeed a prayer there is like a thousand elsewhere”. 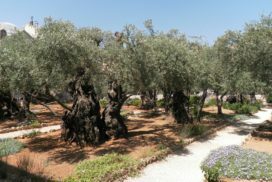 Located 2 miles east of Jerusalem on the eastern slope of the Mount of Olives, Bethany was the home of Lazarus and his two sisters, Mary and Martha, whom Jesus loved. The village has carried the name Lazarus since the fourth century and it is where Jesus performed the great miracle of raising Lazarus from the dead.